Our story with PA started out the same as many of yours. Our sons were born looking perfectly healthy, besides being born six weeks early and being twins. Everyone that saw them thought they looked wonderful and would go home from the NICU rather quickly. However, that all changed on the sixth day of their life. I got a call from the doctor in the NICU that Grant was struggling and had to be put on a ventilator, but they thought it was just a virus of some sort. By the time I got to the hospital he was completely comatose and there were swarms of people around him. They were trying to explain exactly what they thought had happened, but all I could understand at the time was that he was very sick and they didn’t know what to do. They were running a lot of labs on him and his twin brother Sebastian to try and see if both boys had a metabolic issue of some sort. We were quickly transferred to another hospital that had dealt with these types of conditions before. While I can remember the whole day perfectly now, in the moment everything was a blur and I seemed to be just a spectator as they hooked both boys up to an abundant amount of machines that seemed so humongous in comparison to their little 4lb bodies. They were too small for traditional dialysis, so they attempted to come up with a plan. Fortunately there was actually a visiting geneticist who was interviewing for a position at the hospital that day, who mentioned he had heard of combining ECMO and dialysis to help patients who were very small. This is what was decided as the best course of treatment for our sons. I will never forget standing over my son as they hooked up IV’s and poked and prodded him, all without him making a single, solitary sound. The ECMO and dialysis combination worked, even better than the doctors had anticipated and it seemed that both boys were on their way from catabolic to anabolic. Over the course of the next few weeks, we learned all about PA and the life that would now be our new normal. It was quite the operation at our house to get them fed around the clock, once they came home, thankfully we had and continue to have amazing support from family. The boys have had many hospitalizations since they have come home and have definitely given me lots of new gray hairs, but they have come so far. 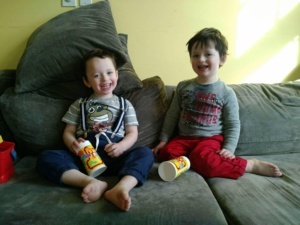 While our normal is being hospitalized with one or both of them at least once a month, they continue to grow and show us just how determined they are. They both started preschool this year and are riding the bus everyday to school. Anyone they come into contact with quickly becomes a new friend. It is so amazing to see how positively they affect the people that they come into contact with. It’s as if their personalities and happiness are contagious. Mom of Grant & Sebastian M.